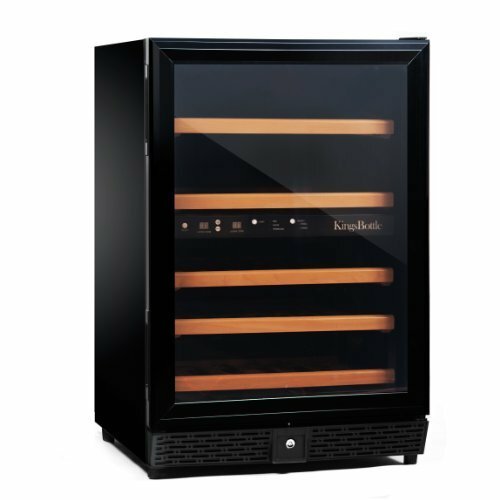 The Haier Aficionado Wine Cellars are cheap wine refrigerators sold by Haier America the US sales and marketing branch of the Chinese home appliance manufacturer, the Haier Group. The Haier Aficionado Series wine cellars are available in 3 capacities: 18-bottle, 37-bottle and 52 -bottle models. adjustable humidity control – besides temperature and darkness humidity is another important factor regarding storage conditions. The silver cabinet with the double pane, tinted glass door looks great. The door has a silver grip handle. The grey interior matches the all-silver decor of the cabinet. The wood trim of the 5 slide-out chromed shelves adds elegance to the unit and allow easy access of the wine bottles. Price of the Haier Aficionado 37-bottle Wine cooler: the appliance is available for around US$ 480-700 (US$ 12.97-18.92 per bottle) which is a nice price. TIP: Similar wine storage unit are the Franklin Chef 36-bottle wine cooler with 2 temp. zones and the Amcor WV-50 wine cooler with 35 bottle capacity. 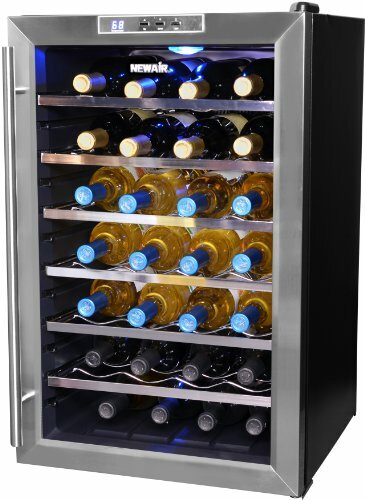 The 52-bottle Haier Aficionado wine cooler has silver cabinet with brushed metal door with silver grip handle. The door has tinted, double pane glass through wich you can admire your wine collection illuminated by the soft interior light. A lock & key set is included should you wish to keep your precious wines protected against unwanted access. The LED display on the top part of the cabinet shows the actual temperature and humidity level inside the cellar. The control buttons for temperature and humidity setting are next to the display screen. The 8 pull-out shelves and the 3 adjustable shelves with wood fronts can accommodate up to 52 bottles of wine. 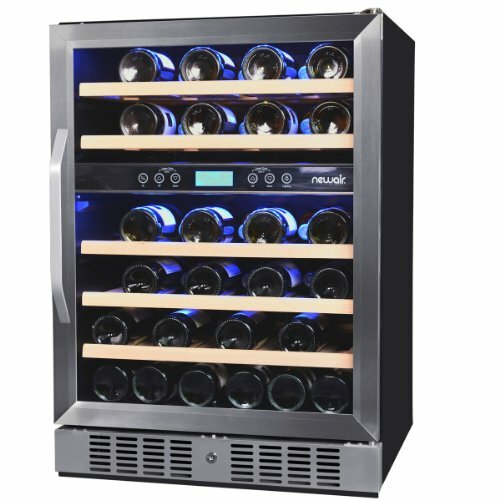 Just like the 37-bottle in the Haier Aficionado series, this unit also has electronic thermostat for adjusting cooling temprature but it also comes with preset temperatures for red and white wines. There’s adjustable humidity control to set suitable humidity level inside the wine cellar. Price of the 52-bottle haier Aficionado wine cellar: cc. US$ 800 (US$ 15.38 per bottle). N’FINITY 50-Bottle 2-zone Wine Cellar – an attractive wine cooler with 5 hardwood shelves by Wine Enthusiast. See reviews of other Dual Zone Wine Refrigerators. The Avanti 46 bottle Dual-Zone Wine Cooler has similar capacity. With under $500 price tag the Magic Chef 44-bottle Dual-Zone Wine Cooler offers a cheap alternative for home wine storage. The Two-Zone Wine Refrigerators by Danby offer good alternative in various capacities, you might also want to read reviews of Avanti 2-zone Wine Coolers. 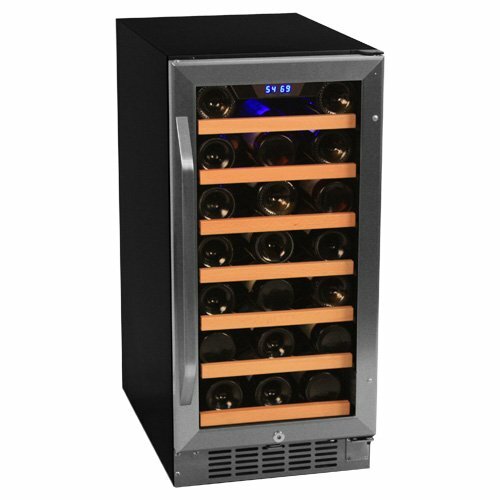 Recommended good-value 40-50 bottle wine coolers, including 2-zone models. In the UK market the Rangemaster Wine Cooler has similar capacity: 50 bottles, though it’s a 1-temperature zone model. 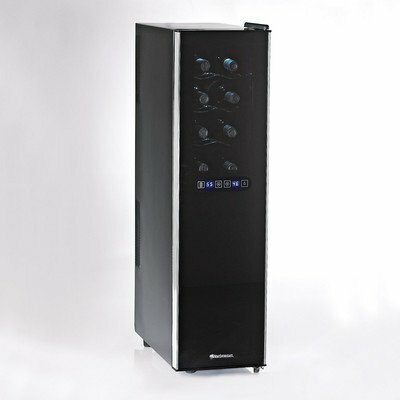 Read review of the Haier Aficionado 18-Bottle Wine Cooler. Where to Buy Haier Aficionado Wine Cellars? It looks like that Haier America doesn’t sell the Aficionado series wine coolers anymore. A few stores and online retaires however still have some models in stock.